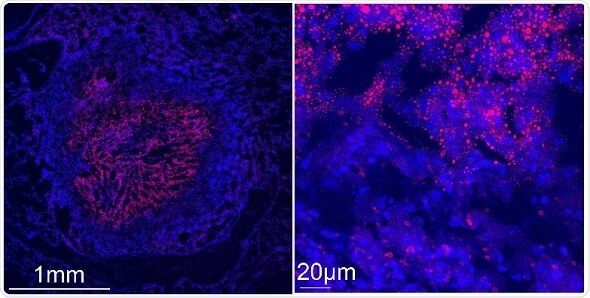 Insights into how harmful white blood cells form during tuberculosis infection point to novel targets for pharmacological interventions, according to a study published in the open-access journal PLOS Pathogens by Valentina Guerrini and Maria Laura Gennaro of Rutgers New Jersey Medical School, and colleagues. Confocal microscopy images show a tuberculous rabbit lung necrotizing granuloma stained with Nile red (red) and DAPI (blue) to reveal lipid-laden cells. Left image: the center of the granuloma is occupied by caseum, a “cheese-like” material that becomes increasingly acellular as necrosis progresses. The caseum is surrounded by a cellular region containing macrophages and lymphocytes. Right image: higher magnification of the cellular region of the granuloma immediately surrounding the caseum. Nile red-stained storage lipids are visible in caseum and in the surrounding foam cells. Credit: Riccardo Arrigucci, Public Health Research Institute, New Jersey Medical School, Rutgers, The State University of New Jersey, Newark, NJ, USA. Foam cells are a type of white blood cell, known as macrophages, that have accumulated fatty, waxy, or oily compounds called lipids. These cells contribute to maladaptive immune responses such as chronic inflammation and tissue damage in a variety of diseases. The formation of foam cells has been most thoroughly studied in the context of atherosclerosis, or hardening of the arteries. During atherosclerosis, macrophages develop into foam cells by accumulating a waxy, fat-like substance called cholesterol. But it has been unclear how these cells form during chronic infectious diseases such as tuberculosis -- a contagious and often severe airborne disease caused by infection with Mycobacterium tuberculosis bacteria. Gennaro and colleagues provide evidence that foam cells in lung tissue from rabbits, non-human primates, and humans with tuberculosis form by primarily accumulating a type of fat called triglycerides, rather than cholesterol as seen in atherosclerosis. Moreover, triglyceride accumulation in human macrophages infected with M. tuberculosis is mediated by distinct signaling pathways from those associated with cholesterol storage in macrophages during atherosclerosis. The findings demonstrate that foam cells store different types of lipids and form through distinct mechanisms, depending on the disease. According to the authors, the findings may have translational implications. For example, molecules involved in triglyceride synthesis may be used as novel biomarkers of progression to active tuberculosis. In addition, manipulating factors that affect macrophage lipid content might be an effective way to treat tuberculosis. Because many of these factors have been extensively studied in the context of cancer, cardiovascular diseases, and metabolic diseases, it may be possible to repurpose pharmacological compounds as therapies against tuberculosis. Such therapies may shorten the duration of antibiotic regimens and help restrict the emergence of antibiotic resistance.